Home Vintage 1940 My Middy Hair Cut. The Perfect Cut for Vintage Sets. Since 1997 I have been trying to get this hair cut. Like many of you I have all kinds of pictures, illustrations and even original cutting diagrams. So the questions is, after such a very long time, why have I never been able to get this cut to happen correctly? Although I’ve had some fabulous hairdressers over the years, I now understand what the difference is. It is all in the training. The modern hairdressing schools teach a very different style of cutting than was taught in years past. There is a myth out there that hairdressers all know how to do the same thing, and nothing could be farther from the truth. They all have different skills and different specialties. 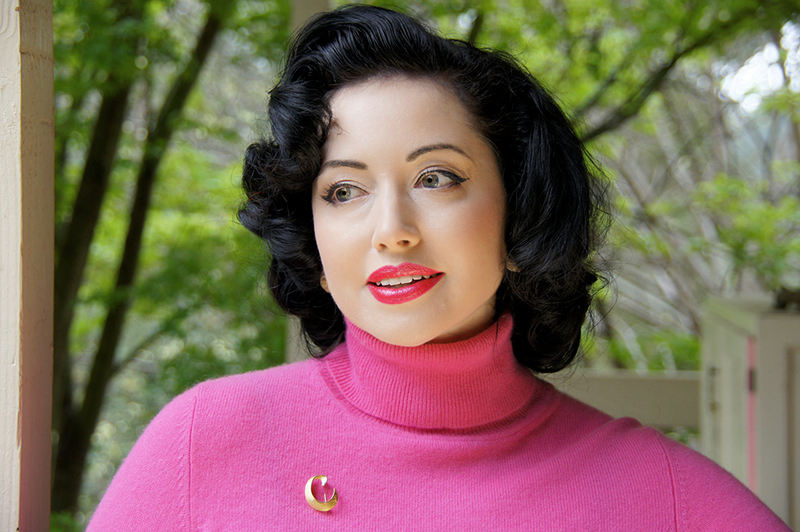 For instance, the hair styling that I provide in my Melbourne based Vintage Hair and Makeup company, is far more complex and time consuming than what most hairdressers have ever tackled. It it what I live and breath, as well as requiring a very different skill set than those skilled colourists for instance. But I don’t cut, I don’t colour. Last week I was recommended to a career hairdresser (Maggie Timms) who has had over 40 years experience and was taught the Vidal Sasson way of precision cutting. She has an excellent understanding of the finished styling I want to achieve, and although this cut isn’t asked for by her day to day client, the core requirement of specialty precision cutting remains. In no time at all, (and without any diagrams needed), she snipped away and created my 6inch middy hair cut. Although my regular colourist is also an excellent cutter, the difference between the close approximation of a 1940s or 1950s style hair cut I usually sport and this new cut, has made an incomparable difference. How can I tell? This cut looks perfect set or unset, it brushes out into so many different styles with the one set, and it has cut my rolling time by more than half. In a nutshell, if you’re looking for the key to a successful Middy Cut, it isn’t in bringing pictures and diagrams, but in finding a long term hairdresser experienced in precision cutting. What are the biggest problems you have when trying to explain your hair cut requests? 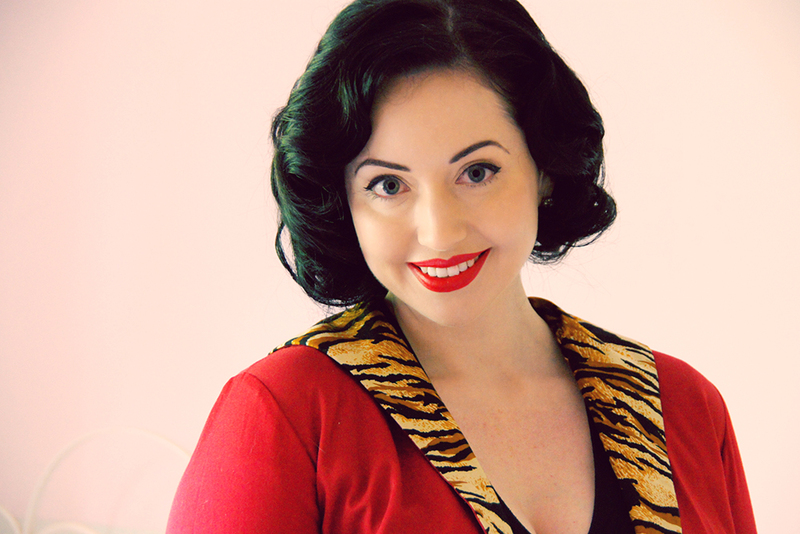 Previous articleFour NEW Ways to Tie a Headscarf – Even More Vintage Glamour! 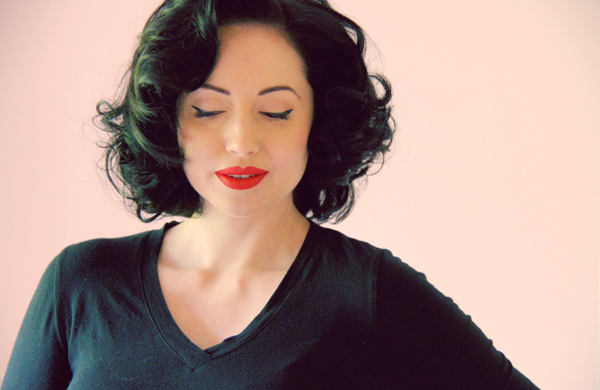 Next articleThe Perfect Vintage Hair Cut – The Middy and How to Style It. 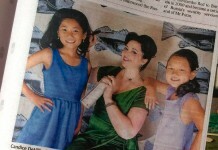 I’m sure your Melbourne followers would love a link to or the name of this fantastic hairdresser! oh my gosh, when I’m back in Melbourne I’m going to have to ask you for her number. You look gorgeous! Lais: Thank you! 😀 <3 Thanks for your comment too, now I've found your gorgeous blog! Yes yes yes!!! I love your hair, it’s perfect and I am in Melbourne and I am on the hunt for a new hairdresser that knows what a Middy cut is. My current hairdresser is about to have a baby and has released me into the wild and with Summer approaching I thought maybe it might be time to cut my very long hair a little bit shorter but I don’t want a modern cut because my hairstyles & dress sense is very ‘old’. So if you could share your hairdressers details it would be soooo appreciated. Your hair looks fabulous (although I do miss the blonde bit you used to have!!). Thank you for your post & for managing to find ‘that’ hairdresser that can cut a middy!!! Lovely haircut! I absolutely agree that showing a picture, either for a cut or even a color, doesn’t usually work out. Each stylist definitely has his/her technique, and on top of that, it depends on their mood that day. When I had a bob, I loved the length, but one day, my stylist was doing too many wedding hair styles that day, and bam, there goes my perfect bob. Gorgeous! I ended up getting my middy done recently at Wildilocks in North Melbourne. I love it so much and she knew exactly what needed to be done. So much easier to curl now. I think it’s absolutely perfect! I’m on the hunt for a hairdresser who can cut a middy and I’m so scared of who I’m not going to find! Maybe I should start looking at older ladies who’ve been in the hairdressing industry for decades!? You look stunning BTW. I too would love to know who you went to! I shall email you when I need my next cut. Frank at Fur did a pretty good job so I’ve got a little while til I need a new cut. Also thought I’d tell you I’ve actually had success with the foam rollers! Who would have thought! I used a Mastey curl hold/style spray as setting lotion (cos Price Attack didnt have the Kusco Murphy) and the curls are INSANE. Even brushed it into a fairly okay look. But really need to start figuring out the best way to do each curl. Anyways – they stayed! Really proper curls that lasted all day. And if I set them again they would last even longer. Amazing! It really suits you! I had the middy plus and I agree it makes setting so much easier and quicker. It’s gorgeous! I’ve been wanting this haircut for so long. I like to keep a short fringe though, do you think this would still work with a short fringe? This is absolutely stunning on you, and although I always loved your blonde streak, I think I like it more all black. 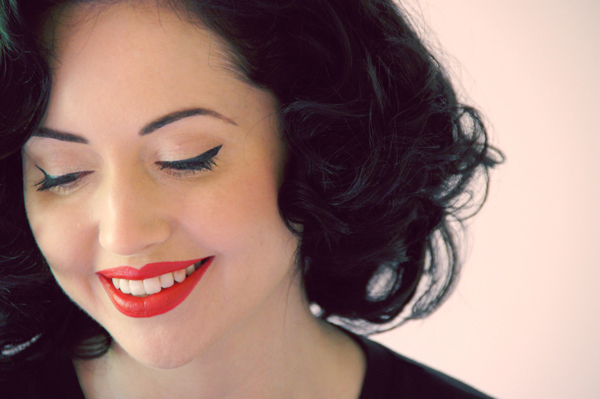 And this may sound kinda nutty, but in that last picture, you are channeling a dark haired Marilyn!!! Suits your face, suits your style.. perfect choice! Such beautiful sets! Glad you finally found the perfect hairdresser for you, would be such a great feeling! I love your middy haircut it really suits you. I recently got my own middy haircut earlier this year, only a slightly longer cut. I’d love to here your styling process to get your final results. Looks great! Beautiful, absolutely beautiful! For this softer look , did you just pull your fingers through it or…? Also, I see where you say you have a tutorial for the hair? You are one of the most gorgeous vintage enthusiasts I have ever seen 🙂 Beautiful!! You have a strong Elizabeth Taylor vibe here, which I completely love. I was googling the Femme Fatale diagram and saw you, along with Taylor along side your photos. You’re so right about a precision cut making a difference. For years I’ve been doing my own hair, but I’ve come to realize I’ll need to find someone who can do this trim for me, if I can’t teach it myself. 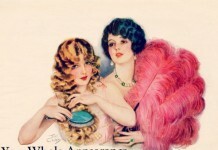 I love your haircut and excellent information about vintage styling. Shameful I know, but have only discovered you this week. 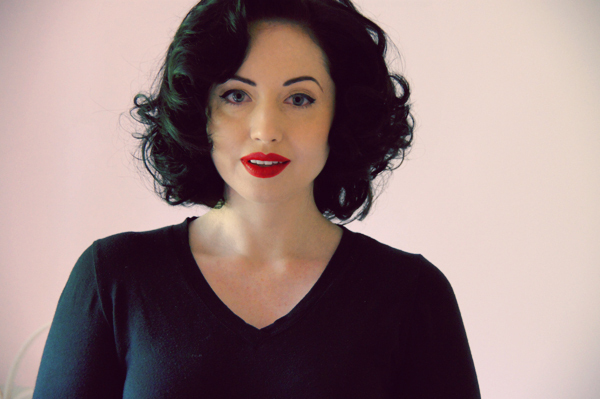 I live in Melbourne and would love to know the contact details of your hairdresser as I am having a difficult time finding someone that will cut my hair that suits the 1940’s styling that I am trying to avheive. I would apreviate your help. Thank you. Such a crush on you and your site! LOVE vintage!